now a Member of Anderson Corvette Association in the Indiana Region. He's pictured on the left with his '95 Vette at some races in Mississippi and on the right at the 2001 National Convention where he was honored as NCCC Men's Champion for 2000. Vince is the youngest person to ever be an NCCC #1 Champion! Way to go, Vince! Former FCOA member Alicia earned her first Corvette by making straight As in high school along with being a varsity cheerleader. When her dad couldn't find a red 1979-82 with a silver leather interior like she wanted, they built one! Alicia's dad is a long-time member of Competition Corvettes of Oklahoma & Tulsa Vette Set in the Southwest Region. This picture appeared in the Detroit Free Press. 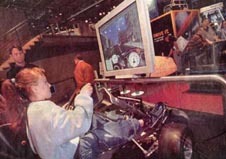 Jamie was attending the 2001 North American International Auto Show and is in the "driver's" seat at a Mini car simulator. She looks like she's having a great time even though she had a hard time reaching the pedals. Jamie's parents are members of the Michiana Corvette Club in the Indiana Region. Donald found a sure way to keep warm on his trip to Alaska. That's what you call a real bear hug! Donald's parents are members of Badger State Vettes in the Midwest Region. 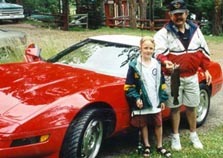 His Grandpa & Grandma are members of both Badger State Vettes & Wisconsin Corvette Club. A 13-year old boy with racing in his blood, Vern now drives a Bandelaro Race Car and loves to be at the track. He hopes to be a big NASCAR star one day! Quote from Vern: "FCOA was part of how I began my dream and lifestyle in racing. Thank you to my mom and dad who put me in my first race car and to all of you who support my racing career!!! Thanks to all, Vern Jr. #84". Vern's parents, Vern & Sheila, and his big sister Lisa (FCOA 0203) are members of Northern Rays, Ltd. in the Midwest Region. Tommi Ann poses with a new Vette in front of the National Corvette Museum. She's so happy because her Dad won the 2001 Z06 that was the grand prize in NCCC's charity drawing! 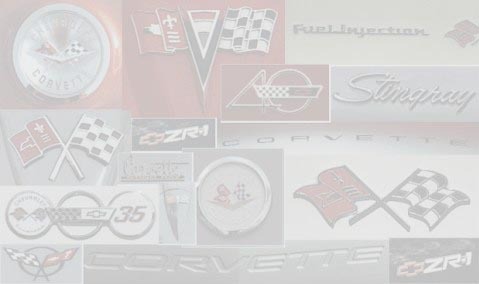 Tommi Ann's Uncle Bob & Aunt Diane are members of Cedar Rapids Corvette Club in the West Region. Scott's favorite things are red Vettes, trips along Route 66 and fishing. His Dad is a member of Suburban Corvettes Club of Minnesota in the Midwest Region.